Mohawk Industries, Inc. is the largest flooring manufacturer in the world. A Fortune 500 multinational company that employs a diverse workforce. 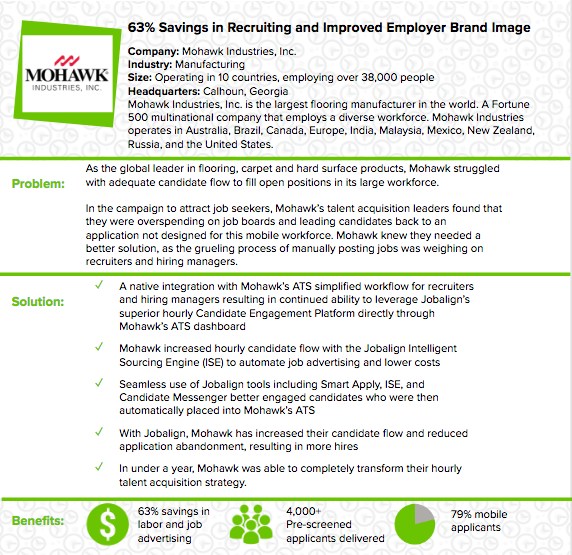 This case study goes over the challenges Mohawk was facing in their hourly hiring process and how working with Jobalign has helped them overcome these challenges. From poor candidate flow and manual job advertising, to the Jobalign Candidate Engagement Platform and ATS integration, this case study covers all of the specific challenges faced and how they were eliminated through the work between Jobalign and Mohawk.